.......53 Buddhas and Me .................My Life Adventures.....: "My Cairns Family"
This week I have had the absolute joy of having my son Shane down in Melbourne from Cairns. Then last night his partner Stacey arrived down hear for a couple of days. It is so nice having them in Melbourne and catching up on all the small stuff that happens in our lives. Shane works in the forestry industry, so he will always live in fairly remote areas and not very close to me. One advantage, I get to visit him in the beautiful Australian locations he lives in. His working career started off on Melville Island - off Darwin coast, then it was in Kunnanurra in Western Australia, then Mitchell, Queensland, which is the gateway to Australias outback. Shane, Susan (my cousin) and I did a road trip through all the outback towns up there to visit Shane & Stacey in 2007. It was one of the best trips I have ever been on, we saw so many different characters and beautiful towns. Now Shane and Stacey are based in Cairns although Shane also works in Tully and Cooktown and they have just bought a house up there. Yes, it does have enough room for me to visit. 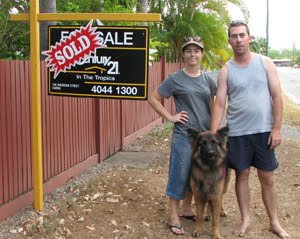 This photo is of Shane, Stacey and their beautiful dog Mitch outside their new house. Perhaps the only advantage to having kids who live elsewhere is the travel one - how cool that you get to see so much of your beautiful country! Great photo, fabulous dog too! How exciting for your son, is this his first house? And how wonderful to have time to catch up with one another! Very nice photo and your son and his partner look wonderful together, they compliment one another! This is their 1st house to live in, they have one that they rent out. Mitch is a beauty! Glad you are getting a visit from your son and his partner. It looks like it is warm already where you live? I guess it's the opposite of here. We are just now starting to cool down. Seems you have a wonderful life :) Nice to know.